A young, promising, pure Filipino artist born in Angeles City, Pampanga in 1988. 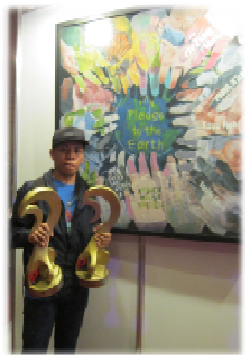 Edu Perreras is a Kapampangan self-taught painter who’s guided and encouraged by his eldest brother Eliseo Perreras. He started painting using watercolor during his secondary education which he uses as a medium in joining different art competitions back then. Afterwards, Edu Perreras developed his talent using Acrylic focusing with realism until later on he get used to Oil and began creating Still Life paintings. Currently, he’s doing hyper realism or photo realism. Newest Wing – Celebrates Kapampangan Artistry With Art Assosiation of the Philippines (AAP),SM City Clark, Clark Field Pampanga, Philippines.